TVS has launched their much awaited (and pretty much overdue) 200cc motorcycle called the Apache RTR 200 (4V) at a starting price of Rs 88,990 ex-showroom Delhi. It’s launched in two variants – one with carburetor and the other with fuel injection. The FI version starts at around Rs 1,07,000 and goes upto Rs 1,15,000 for the ABS version with Pirelli tyres. All prices are ex-showroom Delhi. Sporting a mono-suspension at the back for the first time, the RTR 200 is TVS’s most modern, powerful, sophisticated and advanced motorcycle to date. The motorcycle comes equipped with a 197.75cc, oil cooled, 4 valves, SOHC engine and churns out 21PS (20.5PS for carb) of power at 8500RPM and 18.1NM of torque at 7000RPM. It comes to life only by the press of a starter button, yes, the kick is gone. The all-new engine is housed inside, what TVS calls, the Double Cradle Split Synchro Stiff Frame. At the front, doing the duties to soak up bumps is a pair of 37mm conventional telescopic forks while the rear has a mono-shock (as mentioned earlier), and the kerb weight is 148.5 kg. Both wheels are 17-inches with 90/90 rubber for the front and 130/70 for the rear. Stopping power is provided by a 270mm petal disc at the front and 240mm one at the rear. TVS would be offering optional ABS and two tyre choices between Remora and Pirelli (race-spec tyres). 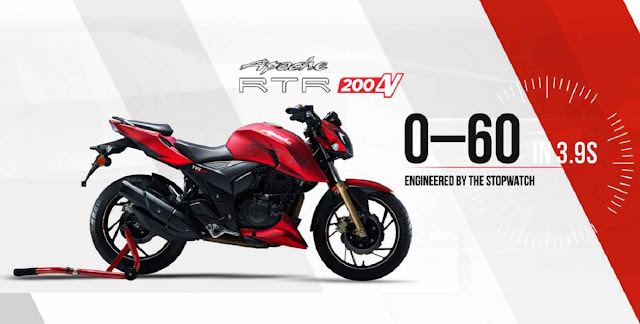 This new motorcycle under the Apache brand would be competing with Bajaj’s NS200 and KTM Duke 200, and while the power figure doesn’t really seem to pose a very serious threat to the other two, what’s a bit more disappointing is that the RTR 200 has a 5-speed gearbox instead of 6. It would be interesting to observe the gear-ratios so that it doesn’t lose out at the top. Yet, the company claims 0 to 60 kph in 3.9 seconds and to 100 kph in 12 seconds.